Chronicling Life. 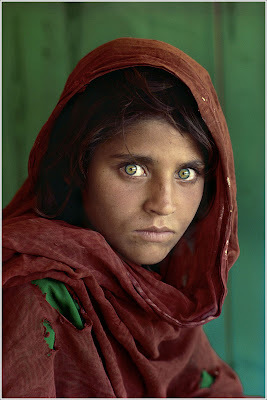 : The Afghan Girl. This picture is so mazingly haunting, she looks like a post card of Afganishtan...an endless array of lost chances! absolutely....it is at once terrible and beautiful..
pain, fear, steel and survival. Her eyes say it all....Anger, pain, helplessness, aggression, oppression....Everything! I did see the photographer on television as he went back to Afghanistan looking for her. And he finally found her. It was a shock for her when she was discovered again. The Eyes,omg.Thank you for visiting! When the picture had first come out, it shook the world. When it came out again years later, it became a collector's item.